This design offers sufficient gutter space on sides to allow through wiring and easy lug connection. 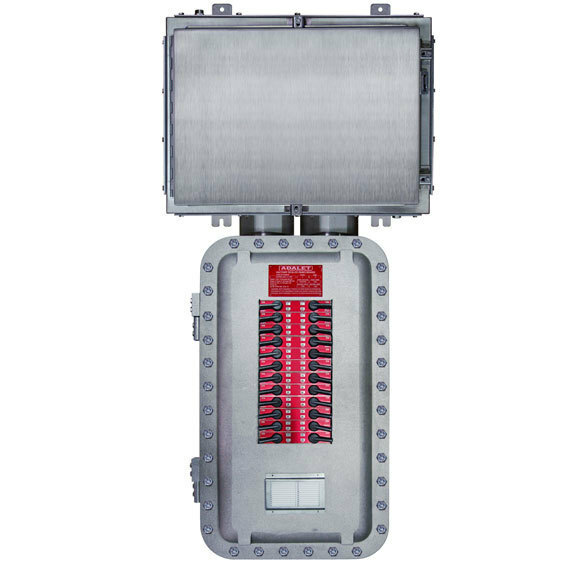 All enclosures are furnished with hinges, stainless steel quad lead cover bolts and are provided with NEMA 4 gasketing. All covers are removable for clear access to breakers and gutter space. The compact design of rectangular housings permits close grouping on switch racks and other structures. No additional space is required for cover removal except from the front. The housings are copper-free cast aluminum alloy. The housings are Adalet XCE series and have precision ground cover and body joints. The design offers sufficient gutter space on sides to allow through wiring and easy lug connection. All enclosures are furnished with hinges, stainless steel cover bolts and are provided with Nema 4 gasketing. All covers are removeable for clear access to breakers and gutter space. The compact design of rectangular housings permits close grouping on switchracks and other structures. No additional space is required for cover removal from the front. The front mounted power panel and lighting panel branch handles can be padlocked either in "off" or "on" position. All breaker handles are spring loaded allowing closing over the cover with breaker toggle in any position. Operating handle shafts have "V" ring gaskets for watertight application. Breaker panel chassis, featuring bolt-on circuit breakers, are made by Cutler Hammer. Chassis for the (XPB2) series power distribution provide 480/277 volt connections. The circuit breakers are rated for 480 volt max.